Ah…dusty game day. Well, mostly just a game day that granted the opportunity to play some old titles as well as a new one. 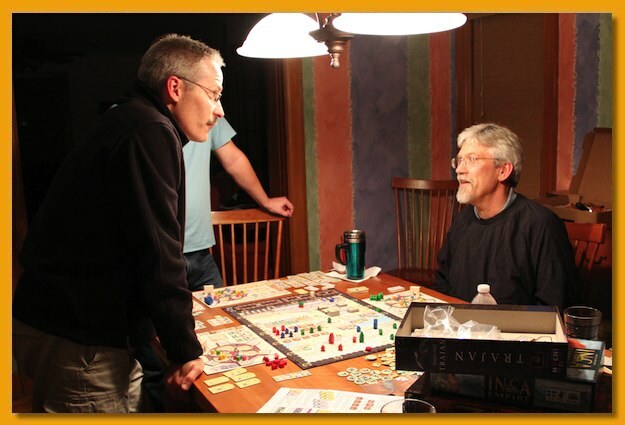 When I sent out the offer to host a game day to my analog game group, I didn’t get a rousing response. People have very busy schedules this time of year and it’s just hard to get a quorum together. After shifting around the date a bit, I did manage to get two to commit and with three, we really had a lot of fun. 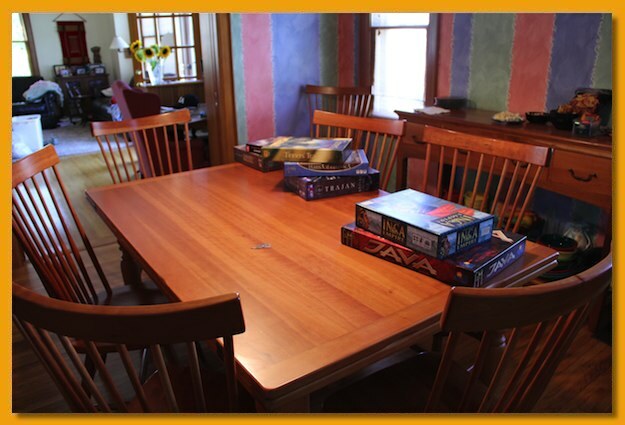 Three is a great number for board gaming. You can really churn through the games quickly with little downtime on your turn. It helps to, that these guys are smart, quick learners, good listeners, quickly players (not a lot of analysis paralysis), and just enjoyable to be around for the day. 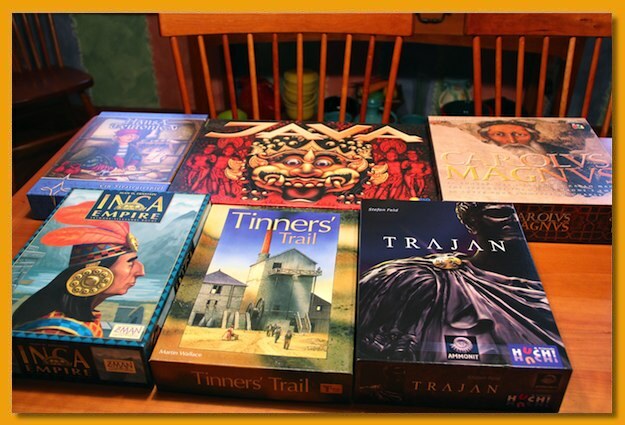 The original request started with a list of dusty games that I hadn’t played in years (or ever) so I pulled out Java, Tinners’ Trail, Carolus Magnus, Hansa Teutonica, and Inca Empire. However, I’d recently received a copy of Trajan and couldn’t resist throwing that one on the table as well. As it turned out, we got through five games in ten hours with a couple of breaks for snacks, drinks, and pizza. First up was Hansa Teutonica. 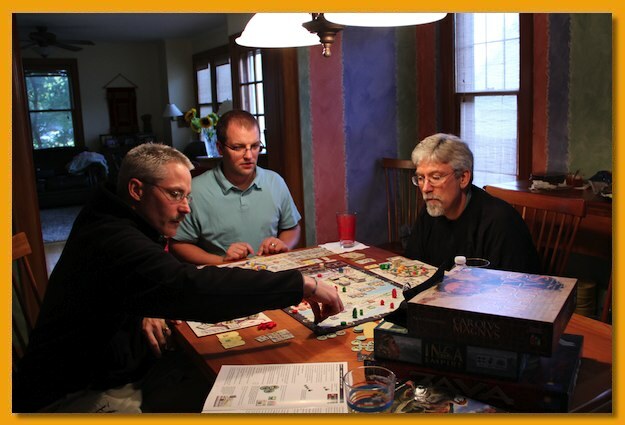 I first played HT at Great Lakes Games in 2009, hot off the presses from its Essen release. I played it again at Origins in 2010 but since then, nothing. There are a lot of rules to get through and I hope I didn’t make it too confusing. I pride myself on teaching a game well, a skill worth mastering in my opinion. Neither Jason nor Nevin had played before so we got through the sometimes confusing rules of the desk and the latin text (!) and got going. I advanced quickly on extra actions and clearing other parts of my desk and was a bit of a run-away but that’s not unexpected for a first game against new players. Hansa Teutonica has a lot non-intuitive strategies that first time you play and I’d welcome another play soon. Hansa Teutonica is a pure, cube-pushing, Eurogame. They’ve wrapped a theme on top of an otherwise abstract game but I still like it. I’ve always liked Tinners’ Trail. 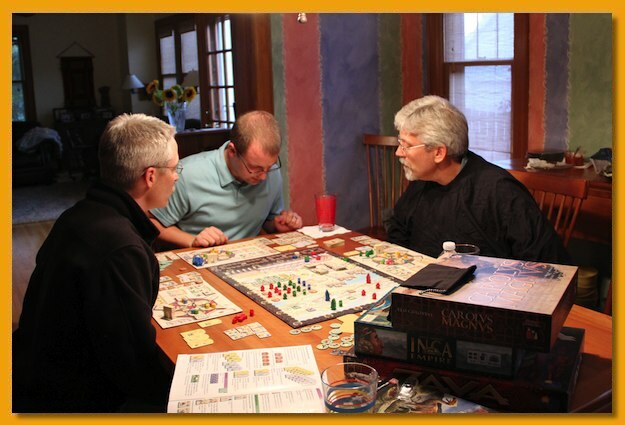 Although mostly a math-based, economic game, common in many Wallace-designed games, I find that the theme and the historical setting mesh so well with the game that the rules are relatively easy to remember. We got off to quick start mining copper and tin, pumping water out of the mines, and trying to make money in the highly volatile ore industry of 19th century Cornwall. For the most part, the game works pretty well but the external investment action “chart” where you concert money to victory points seems odd. I like that investing earlier has a better pay off but it seems that investing larger chunks of money should have a better pay off than smaller. 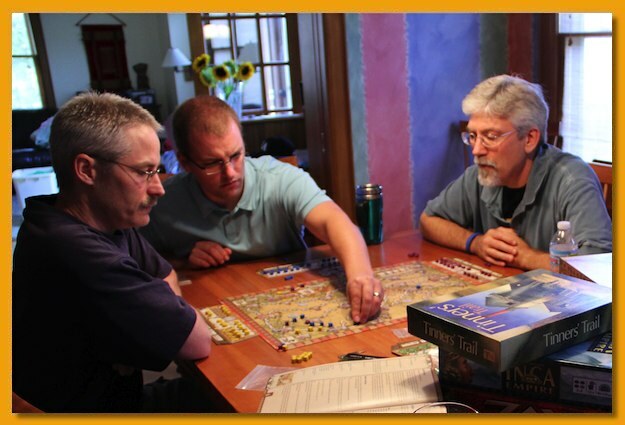 Next up, a totally new game to all of us, Trajan. 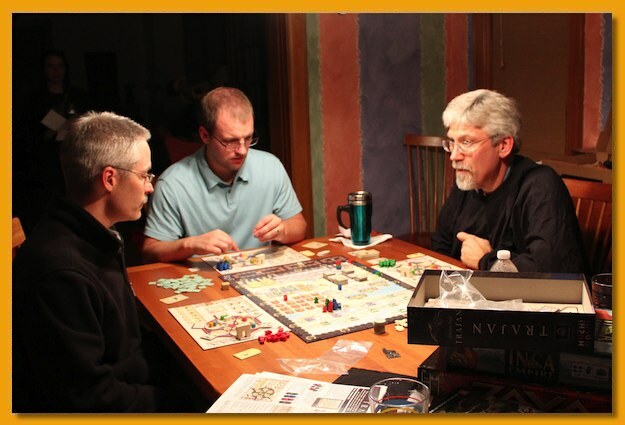 I’m a complete fan of Stefan Feld designed games. Most of his games I’m familiar with feature some negative aspect that occurs every turn or group of turns that you can use resources, actions, and time to prevent or reduce the impact of or choose to ignore with hopes of making up the loss by using those resources, actions, and time for other purposes. Trajan features a mechanism where each round (there are 16), a demand tile flips up and on every fourth round, instead of flipping up a new demand tile, a “season” ends and you are charged with paying for the demands of the people by giving up items you’ve collected during the course of the season. If you can’t meet the demands you lose points. I’d read through the rules several times and I usually play a sample round or two to get my head wrapped around the rules but I’d not even punched the game yet so it took us a while to get going. There are a lot of bits in this game but it’s a keeper. Trajan features a central board filled with lots of cardboard and different areas to score points. Your job is to gather tokens, take actions in one or more areas of the board, and vie for votes in the Senate to gain access to additional end game bonus tiles. To accomplish all of this, each player manages a personal player board containing a Mancala-style mechanism but organized in Mac Gerdts-ish rondel. On your turn, you pick up all of the colored “stones” in one of the rondel cups and dropping one in each cup as you continue clockwise around, you eventually place the last stone in a cup and take the action associated with the target/final cup. Rounds are based on time component that equates to how many stones you pick up from the starting cup. The more stones you move on your turn, the faster the round will be over because you’ve spent more time taking the action. Trajan is a bit of a solitaire experience but there are some areas on the board featuring some direct conflict. But that rondel is pure joy trying to figure out how best to set up what you need to accomplish. We took a little break, ordered a pizza and decided to break out Carolus Magnus while we waited for my daughter to bring back the pizza on her way home from work. Carolus Magnus is an abstract game with the thinnest veneer of theme pasted on. 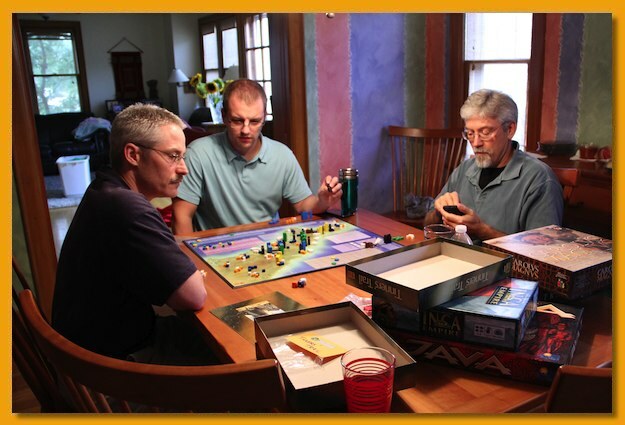 Players push cubes around the islands and onto their player board in an attempt to gain control of the islands. In addition, players try to gain control of adjacent islands to trigger them to collapse into larger more powerful territories. Jason did a great job of setting up a final move that there was no way to thwart for the win. 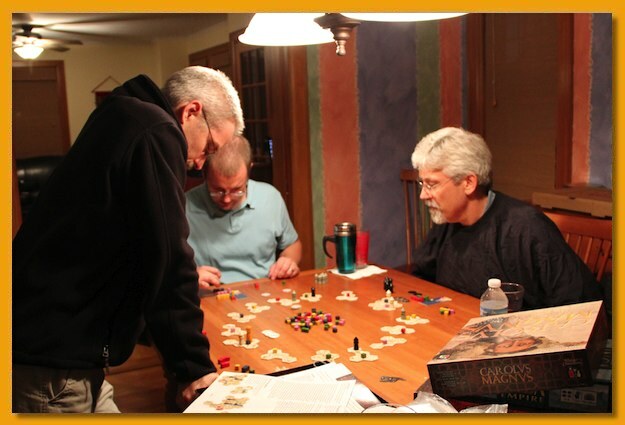 Carolus Magnus is one of my favorite games for three but the design is definitely showing its age. I still like to play and won’t turn down a game but there are a lot of games I like more. We pulled out Trajan again for our final game of the night. We don’t normally play the same game two times in the same night so this was a welcome pleasure. This game took about half the time of the first coming in at about an hour and fifteen minutes which is faster than the box even states (about 30 minutes per player) so we really burned through it quickly. Set up is a bit of a pain due to the large number of cardboard tokens but since all three of us knew what to do we all did our part to get up and running quickly. Of course, after the game we had to decompress discussing how all of us were so close to doing better if X or Y had happened, or how our plans for Z fell through because of some move or the failure to accomplish some goal. Whenever that happens, you know you’ve got a winner on the table. You can tell when people are ready for another game when they’re thinking about how they would have played differently. That’s what I like most about gaming, how it gets into your mind, exercising muscles you didn’t know you had, burning new pathways of thinking and problem solving. And, you get to spend time with great friends. Thanks guys, I had a blast. I periodically host a game day outside the standing one or two game days a month and in the past we’ve usually picked titles from whatever people brought and from my collection (currently just north of 250 games). This time, however, I decided to bone up on some old titles and take the first two or three responders in hopes of being able to play some dusty games I haven’t played in years choosing those with sweet spots with the right number of players. As it happened, many of the regulars were busy this weekend but I did manage to find two that are coming for a day (and night) of gaming for three. I’ve boned up on the titles in the image above; all are from my dusty games category. I’d need to hold several game days to get through all of my dusty titles but these are the ones we’re going to choose from. Now, I freely admit that one title, Trajan, is not dusty. In fact, it’s just out of shrink but two of us are really chomping at the bit to play it so that one is going to slip in. Just missing the cut were Wallenstein, Rails of Europe, La Citta, and American Rails. Up on the docket are clockwise from the top left, Hansa Teutonica, Java, Carolus Magnus, Trajan, Tinners’ Trail, and Inca Empire. Thoughts?